Darrell Ray Porter (January 17, 1952 – August 5, 2002) was an American professional baseball player. He played as a catcher in Major League Baseball for the Milwaukee Brewers, Kansas City Royals, St. Louis Cardinals and the Texas Rangers. He was known for his excellent defensive skills and power hitting. He was also one of the first American professional athletes to publicly admit he had a problem with substance abuse. Born in Joplin, Missouri, Porter was drafted by the Milwaukee Brewers in the first round of the 1970 Major League Baseball Draft. He made his debut on September 2, 1971 with the Brewers at age 19. He finished third in the 1973 Rookie of the Year voting. Porter was selected to the American League All-Star team in 1974, but had his best years after he was traded in 1976 to the Kansas City Royals, where he was selected to the All-Star team four times. In 1979, Porter led the majors with 121 walks and became only the sixth catcher in Major League history to score 100 runs and have 100 runs batted in. The feat had previously been accomplished by Mickey Cochrane, Yogi Berra, Roy Campanella, Johnny Bench and Carlton Fisk, all in the Baseball Hall of Fame. Only Porter and Cochrane had 100 walks, runs and RBI in a single season. He became a fan favorite for his intensity; teammate George Brett once said of Porter, "Darrell always played like it was the seventh game of the World Series." Porter told the Associated Press that during the winter of 1979-1980, he became paranoid, convinced that baseball commissioner Bowie Kuhn, known to be tough on drug use, knew about his drug abuse, was trying to sneak into his house, and planned to ban him from baseball for life. Porter found himself sitting up at night in the dark watching out the front window, waiting for Kuhn to approach, clutching billiard balls and a shotgun. During spring training in 1980, former Los Angeles Dodgers pitcher Don Newcombe paid a visit to the Kansas City clubhouse. He asked the players ten questions, the point of which being if a player answered three or more of the questions with an affirmation, the player might have a problem with drugs or alcohol. Porter affirmed all ten questions and checked himself into a rehabilitation center, admitting he had abused alcohol, cocaine, Quaaludes, and marijuana. After checking into the rehab center, Porter became a born-again Christian, married, and became a spokesman for the Fellowship of Christian Athletes. His production on the field declined after rehab, never again approaching his 1979 levels. He went on to play in three World Series, in 1980 with the Royals and in 1982 and 1985 with the St. Louis Cardinals, winning both the 1982 National League Championship Series Most Valuable Player Award and the World Series MVP Award in 1982. At the time, Porter was only the second player in baseball history to win both awards in a single postseason, following Willie Stargell of the Pittsburgh Pirates in 1979. 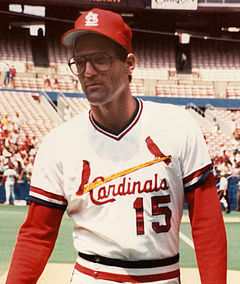 After the 1985 season, the Cardinals released Porter, and he wound up his career with two seasons with the Texas Rangers as a part-time player. Over 17 major league seasons, Porter had a career batting average of .247 and an on-base percentage of .354 with 188 home runs, 826 RBIs and a .982 fielding percentage. As of the 2009 season, he ranked 21st on the all-time list for home runs by a catcher, and 20th for RBIs by a catcher. Porter caught two no-hitters during his career: Jim Colborn in 1977, and Bob Forsch's second career no-hitter in 1983. Porter was also notable for being one of the few Major League catchers of his time to wear eyeglasses behind the plate, at a time when most players needing vision correction were using contact lenses. Porter was married twice. His first marriage, in 1972 to the former Teri Brown, ended in divorce in 1976. On November 29, 1980, Porter married Deanne Gaulter. The couple had three children: Lindsey, Jeffrey, and Ryan. In 1984, Porter wrote an autobiography titled Snap Me Perfect!, in which he detailed his life in baseball and his struggles with substance abuse. In 2000 Porter was inducted into the Missouri Sports Hall Of Fame. He dabbled in both broadcasting and the antique business on and off during his post-baseball years. On August 5, 2002, he left his home in Lee's Summit, Missouri, saying he was going to buy a newspaper and go to the park. He was found dead in Sugar Creek, Missouri, outside his vehicle that evening. An autopsy found he had died of "toxic effects of cocaine;" the level of cocaine in his system, consistent with recreational use, induced a condition called excited delirium that caused his heart to stop. Police theorized that Porter's car went off a road and got caught on a tree stump in La Benite Park in Sugar Creek, a Kansas City suburb. He got out of the car, walked to the nearby Missouri River and then back to his car. Authorities had initially speculated that he overheated while trying to push the car off the stump in high heat and humidity, but there was no evidence to indicate that he tried to move the car. The exact scenario at his death is still unknown. Dallas News: "Darrell Porter's Sad Final Chapter"